Is Santa so jolly because he’s in good health? Have you ever stopped to wonder why it is that Santa Claus is so jolly? My conclusion is quite simple. 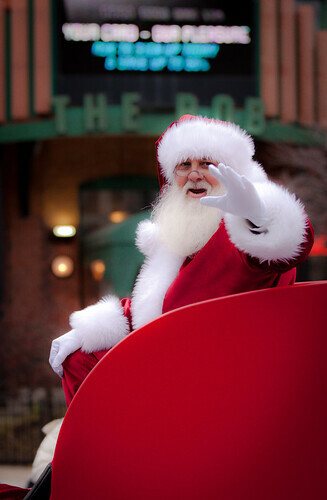 Santa works one day a year with the singular task of bringing presents to youngsters all around the world. How lucky is he? But that can’t be the only reason why Santa is so cheerful and merry. I’m going to go out on a limb here and assume that there must be more to it. Santa gives away toys to children. This shows that Santa is a generous soul. When a person is generous and gives to others, there is a euphoria created by dopamine. Dopamine is a neurotransmitter that associates with happiness and reward, and has been found to be the link between rewarding sensations of pleasure. I’m pretty sure Santa knows being generous just makes you feel good. Santa is great at climbing chimneys. Contrary to popular belief Santa does not spend all year just sitting on the couch, he is practicing his climbing abilities! Santa is well aware that staying active, thus sitting as little as possible each day can add a couple extra years to his life. Santa hauls around a big bag of toys. I have been informed by a couple of the elves at the North Pole that Santa does at least one hour of weight lifting per day in order to be ready for the big day. I did the math and at Santa’s current weight he is burning over 300 calories during each weight-lifting session! Santa is a proud pet owner. This surely contributes to Santa having such low blood pressure as it has been proven that pets control blood pressure better than some drugs. Not only helping in lowering blood pressure, but pets are known to stave off loneliness, provide love and companionship, reduce stress levels, help with social support and encourage daily exercise. With Santa’s fleet of reindeer, Santa surely receives his daily dose of all the above! Santa gets plenty of sleep. Santa knows how important a good’s night sleep is. Not getting enough shut eye can cause a person to become more vulnerable to illnesses, and has been linked to other health issues such as stroke, heart attack and diabetes. Weight gain is often caused by not enough sleep as well, something we all want to avoid. Yes, Santa knows that 7-9 hours per night is perfect, for 364 nights a year anyways… one night without is a sacrifice he is willing to make. And after a quick call to the North Pole, my assumptions were verified by the jolly old elf himself. Just promise you won’t share Santa’s secrets … unless you want a bit of coal in your stocking!